In a bizarre turn of events less than two weeks before a critical evidentiary hearing held by the NRC's Atomic Safety and Licensing Board, Powertech has been desperately trying to fend off an effort by the Oglala Sioux Tribe and the "Consolidated Intervenors" to force the Canadian company to disclose newly-acquired geological data that could impact the NRC's licensing of the proposed Dewey-Burdock uranium project. The ASLB recently ordered Powertech to disclose the data to the Tribe, the intervenors, and NRC staff, stating that the data is relevant to the Tribe's contention that Powertech has not provided adequate information to demonstrate the ability to contain migration of mining fluids. But a day after issuance of the order, Powertech attorney Chris Pugsley fired off an email to the ASLB. Pugsley ignored the Board's order requiring Powertech to provide a date for disclosure of the data to the parties, arguing that it is irrelevant to the evidentiary hearing, and also indicated that Powertech flatly refuses to disclose the data to the public. Pugsley appealed to the ASLB for an opportunity to present arguments against disclosure, which the ASLB agreed to in an order issued a day later. Pugsley also made the surprising claim that the data "is not completely within Powertech's possession", three months after the company announced the purchase. And the email includes a curious statement that appears to imply that Powertech has been in possession of other geological data for Dewey-Burdock that has never been disclosed to the NRC and intervening parties as required by NRC regulations. The fact that Powertech strayed from the NRC's procedural rules by submitting its response by email rather than a formal motion suggests that Powertech officials and attorneys are highly agitated by the ASLB's order to disclose the data. The ASLB agrees with the Tribe and the Consolidated Intervenors that the new data is relevant to one of the seven contentions to be adjudicated at the hearing, namely, Contention 3: "The Final Supplemental Environmental Impact Statement Fails to Include Adequate Hydrogeological Information to Demonstrate Ability to Contain Fluid Migration and Assess Potential Impacts to Groundwater." Powertech's aggressive efforts to prevent disclosure of the data just days before the hearing raises questions about what the data contains as well as Powertech's motives, and could potentially taint the hearing if data relevant to one of the contentions is hidden from public scrutiny. The data consists of historical drill hole logs and maps prepared by the Tennessee Valley Authority, a federal agency which controlled the Dewey-Burdock area in the 1970s and 1980s and drilled approximately 4,000 exploratory boreholes. The TVA also conducted three aquifer pump tests in 1979 and 1982 (this data was previously disclosed). Powertech issued a news release July 16 announcing the acquisition of the historical drill logs and maps from Energy Fuels Resources (USA) Inc. in a deal that was struck more than two months earlier on May 9. According to the news release, the data "is expected to assist Powertech's planning of wellfields for the Dewey Burdock uranium property by providing additional quality data to complement Powertech's existing database." 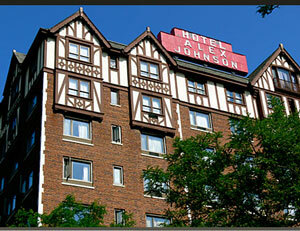 Hotel Alex Johnson in Rapid City, South Dakota, site of the August 19-21 evidentiary hearing conducted by the NRC's Atomic Safety and Licensing Board. NRC staff issued a Source and Byproducts Materials License to Powertech on April 8, but placed a temporary stay on the license on April 30. On May 20, the ASLB lifted the temporary stay. Although Powertech acquired the data on May 9, it intentionally delayed announcing the data acquisition more than two months, possibly to avoid an issue which could have potentially affected the ASLB's ruling on the temporary stay. More importantly, since the data was acquired after a license was issued, it was excluded from the detailed analysis required under the National Environmental Policy Act. In response to Powertech's July 16 news release announcing the data purchase agreement, the Oglala Sioux Tribe filed a motion on July 22 seeking to cross-examine Powertech's expert witnesses to determine why the company did not previously disclose the existence or content of the data. On August 1, the ASLB denied the motion, stating that the credibility, motive, and intent of Powertech with respect to the newly-acquired data is "beyond the scope of the admitted contentions in this proceeding". The data could potentially affect the NRC's NEPA analysis and the resulting conclusions in the Final Supplemental Environmental Impact Statement for the project. Powertech's revised 2013 Technical Report, which provides much of the scientific basis for the NRC's licensing decision, describes the hydraulic isolation of the two aquifer formations that would be mined, the Fall River and the Lakota/Chilson. According to Powertech, the two formations are physically and hydraulically separated from each other by the Fuson Shale. Such separation is critical to be able to effectively contain mining fluids and take corrective actions to stop excursions. "The aquifer test results indicate that the Fuson member of the Lakota formation is a leaky aquitard separating the Fall River and Lakota aquifers. The hydraulic communication between the two aquifers observed during the tests is believed to be the result of (1) general leakage through the primary pore space and naturally occurring joints and fractures of the Fuson shale, and (2) direct connection of aquifers via numerous old unplugged exploratory boreholes. Whereas, the former leakage mechanism is a regional characteristic of the Fuson, leakage caused by borehole short-circuiting is probably limited to the relatively small area of intensive uranium exploration in the Burdock vicinity." "The reported "leaky aquifer" response likely is related to (1) Well 668 that is completed in both the Chilson and Fall River and can provide a direct communication pathway, and/or (2) the presence of open boreholes that may provide communication between the Fall River and Lakota (Chilson) in a limited area near the Burdock test, or communication between the Fall River and land surface. The test results do not support a leaky confining zone (Fuson Shale)." Interestingly, the TVA pump tests utilized many more monitoring wells than Powertech's tests. For example, the TVA's Burdock tests used fifteen monitoring wells, and two separate tests pumped from both the Lakota and Fall River aquifers. In contrast, Powertech's Burdock test only pumped from the Lakota/Chilson aquifer and used only one monitoring well in the overlying Fall River aquifer. The NRC issued a license for Dewey-Burdock conditioned on Powertech's promise to attempt to locate any unplugged exploration boreholes that might contribute to excursions of leaching fluid. If Powertech can find the holes, they may be plugged if the company determines that "the well poses a potential problem". If unplugged holes cannot be located, Powertech says it may then design the affected well field "to minimize any potential impacts". If these efforts fail and excursions from unplugged boreholes occur, monitoring wells are supposed to detect the excursions and pumping is adjusted to try to draw the mining fluids back into the mining zone. The bottom line is that neither Powertech nor NRC staff are confident that old unplugged boreholes can be located, and that the best that can be expected is for Powertech to use its "best efforts" to locate and plug these holes. It is unknown whether the recently-acquired drilling data would help Powertech locate open boreholes, or help to characterize the geology of the Fuson Shale formation. Powertech's focus on potential leakage from open boreholes is understandable since it can theoretically be corrected. Both the TVA reports and Powertech agree that unplugged exploratory boreholes are a serious problem, but one that may be fixable. In contrast, leakage resulting from natural geological characteristics could be a "deal killer" for in-situ leaching. Powertech's Technical Report fails to explain why the TVA's "general leakage" theory is wrong, and in fact doesn't even mention the TVA's conclusion that the Fuson's leakage is a "regional characteristic". In an appendix to a 2009 supplement to Powertech's NRC license application, consulting firm Knight Piesold takes seven pages to discuss and analyze the TVA and Powertech pump tests, but avoids any mention of the TVA's conclusion that leakage through the Fuson Shale is due to naturally-occurring joints and fractures and the inherent permeability of the shale. In the Final Supplemental Environmental Impact Statement for the project, NRC staff notes that Powertech hired a consultant, Petrotek, to develop a computer groundwater model that Powertech cited to support its conclusion that "vertical leakage through the Fuson Shale is caused by improperly installed wells or improperly abandoned boreholes." NRC staff reviewed the computer model and determined that it was "appropriately developed". But the FSEIS is silent on the issue of general leakage through naturally-occurring joints and fractures, and formation permeability, as proposed in the TVA's 1980 report. "Dr. Moran discusses this Petrotek modeling report and sets forth his opinion as to why it is not sufficient to resolve the issues associated with the Tribe’s Contention 3. See Exhibit OST-1, Moran Opening Testimony at 23-26. Specifically, the Petrotek Report relies on inadequately detailed inputs into its model, including for hydraulic conductivity and assumptions of no water flows vertically, which is contradicted by the scientific literature, and unsupported assumptions as to the effect of unplugged boreholes in the area and the lack of any faults or fractures. Id. at 23-24. Dr. Moran further points out the contradictions between the Petrotek Report and NRC Staff conclusions in the FSEIS with regard to the existence of fractures or other flow paths. Id. at 24. Dr. Moran completes his review with a litany of unsupported assumptions made in the Petrotek model that skew the results and render it unreliable as a scientific tool to predict hydraulic conductivity at the site – the ability of the hydrogeology to contain the contamination associated with ISL mining. Id. at 24-26." Even though Powertech provided NRC staff with the 1980 TVA report, it appears that the Canadian company went to great lengths to obscure the TVA's interpretation of its aquifer pump tests, and to spin the issue of the leaky Fuson Shale. Two consulting firms were employed to provide a patina of objectivity, but it is obvious that Powertech's intention was to downplay information that could threaten its licensing effort while promoting a narrative that was acceptable to NRC staff. It is not clear if NRC staff or the contractors hired to write the FSEIS even read the 1980 TVA report; what is clear is that they adopted Powertech's narrative without question. It is possible that the new data acquired by Powertech could shed light on the question of natural leakage between the Fall River and Lakota/Chilson aquifers, as well as the location of open exploration boreholes in the project area. Unfortunately, even if the data is disclosed in the next few days, there is insufficient time for expert witnesses and members of the public to review and analyze the data prior to the August 19 evidentiary hearing, calling into question any final ruling on the Oglala Sioux Tribe's Contention 3.